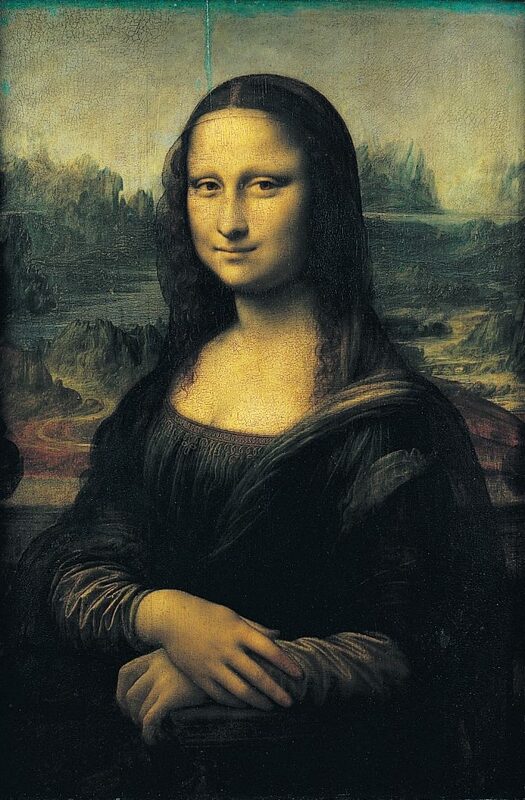 One of the greatest paintings of Italian art is certainly La Gioconda, Leonardo da Vinci’s masterpiece. The painting, better known abroad as “Monna Lisa” (“Monna” is the abbreviation for Madonna and corresponds to the current term “woman”) is kept in the museum of the Louvre in Paris. 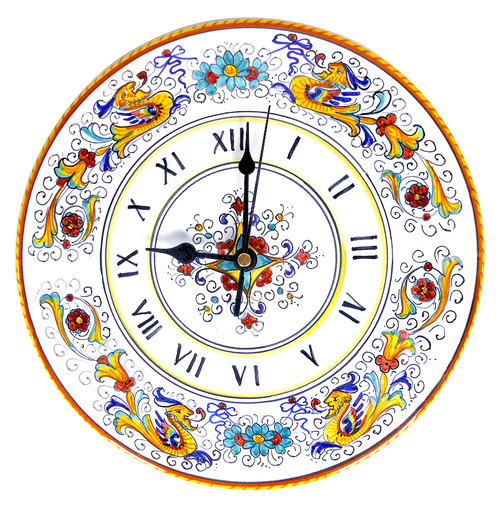 This 77 x 53 cm painting is unsigned, but it is sure the work was painted by the Italian artist Leonardo da Vinci in 1500. However, the artist never considered the work completed and he never gave it to his commissioner. This has often raised questions which, together with many others, haven’t found any answer, yet. Many years have passed since its creation, but the secrets surrounding La Gioconda are far from being revealed: mystery dominates all that relates to this amazing work of art. Mistery created by the penetrating, yet ambiguous gaze of Monna Lisa herself, the identity of whom we do not know. La Gioconda is a typical Renaissance painting characterized by harmony of colors and nuances. The portrait divides the canvas into two main sectors: one where the protagonist predominates the scene, and the second where we can see a landscape with rocks, streets, rivers and vegetation, considered an imaginative place. The painting and its elements have been given several different interpretations. The identity of the subject remains still uncertain, but its image well known: an enigmatic woman, smiling. According to research conducted by Florentine scholars, La Gioconda really existed in the past and she corresponds to Lisa Gherardini, the second wife of the Florentine silk trader Francesco Del Giocondo. The Del Giocondos knew Leonardo’s family: it was the artist’s father, it seems, who put them in touch with one another. Other women have been linked to the identity of the painting and it has also been hypothesized she may have been pregnant due to the way she rested her hands on her belly. Another interesting position on the matter, often considered hazardous, is the theory according to which the subject of the painting is Leonardo himself. This thesis was elaborated not only for the similarity between the painting and Leonardo’s face, but also because the reason Leonardo never returned the painting to its commissioner has never been clarified. The attachment of Leonardo to the painting is still unexplained, but that’s the same for the identity of the person portrayed, which may remain a mystery. La Gioconda, in spite of its popularity, is fundamentally a work of mystery: the smile, the eyes, the subject, all contributed to create an aura of mystery and enigma around it. The eyes and the smile of La Gioconda have been considered the key to reveal its secrets by many. Proof of it is the number of studies carried out on their analysis in the hope to solve, once and for all, the mystery of the Monna Lisa. Will Italy ever receive its “Monna Lisa” back? Where should the Gioconda be, France or Italy? For food, fashion and football France and Italy have always been considered legendary rivals. They have often competed for the primate in these fields, but there is also another diatribe that has linked the two countries: the claim on the famous painting La Gioconda by Leonardo da Vinci. The situation is difficult: many claim La Gioconda should go back to Italy as it was made by Leonardo and, therefore, it is Italian. However, the painting is considered to have been taken to France neither with force, nor because of a theft, but because it may have been sold to it, perhaps by Leonardo da Vinci himself. What is sure is that many Italians have never accepted the fact that they have had to renounce to such a masterpiece created by a famous Italian painter and see it in a foreign museum. Actually, the theft of the painting by an Italian who worked at the Louvre, Vincenzo Peruggia, was a first proof of this non-acceptance. He stole the painting because he was sure it belonged to Italy and there it had to return. A more recent episode has also raised criticism on the matter of the ownership of the painting: the hosting of La Gioconda at the museum of the Uffizi. Italians wanted to bring La Gioconda “back home” and host it in Florence, but France didn’t allow them to do so as the painting is considered delicate and it could easily be ruined. Actually, it is protected by a special glass and the temperature is kept at a constant level in order to prevent the painting from suffering damage. Nevertheless, this choice has been considered by some a little revenge from France after all the public outcry to return the painting to Italy. The relationship between Italians and French has always been quite controversial, characterized by competition and, at the same time, admiration for one another. No matter the place where the painting is situated, La Gioconda is certainly considered one of the most interesting works in the history of Italian art. Perhaps the mystery behind Leonardo’s masterpiece will never be revealed, but at the end of the day, this is what made the painting so famous all over the world.